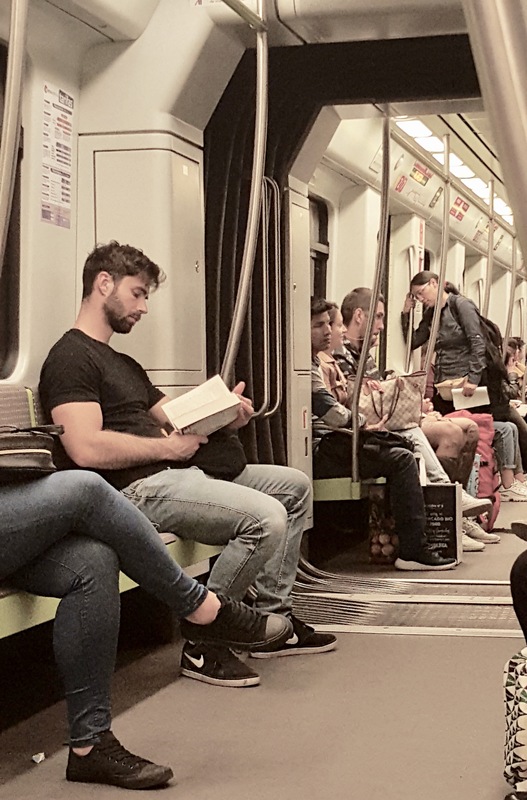 I am honestly not certain what’s more beautiful – an already smokin’ hot man made hotter by reading, or the Spanish countryside between Málaga and València. You tell me, please. Whereas he, unless he is reading Pickup Artists or Trickle-Down Economics Is A Winner, might be your new boyfriend, the countryside looks like it exists inside of a ViewMaster 3D Viewer. The entire countryside is just naturally tilt-shifted. With the gorgeous cloud formations accompanying our entire seven-hour train ride, it often felt surreal. Unlike the French countryside, the Spanish one is far more agriculture-centric. Rare were patches of land not used for either citrus or olive groves, perfectly lined up, and either parallel to, or sprung from the main place of residence as though it were the spot in the lake where the rock had landed and anchored. These massive expanses of farmland, including their homes, are all still in use; people continue to live and work the soil, their lifestyles – at least from a cursory glance thrown out from inside of my own bubble – remain and are largely untouched. Though I’ve never ever been anything but an urban-center kind of broad, this world (most definitely imagined through a slightly more romantic lens than it is in reality) has become increasingly appealing to me. There is great seduction cast by such peaceful solitude. 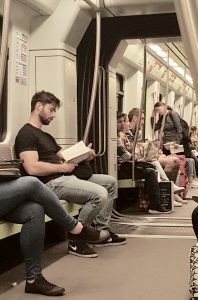 Which brings me back to the Hotness of Hot Dude Made Hotter By His Book. I’ve decided that ‘either / or’ is useless here, everywhere, inside and out, shaken all about. Instead, I’m replacing this notion with a simple ‘and’. Resulting in it’s not that he must compete with the countryside for affection; rather, it’s that he will greatly enhance my countryside olive harvest as he reads to me while we sit shaded by the trees’ bright green burrs. 1. A safe arrival in València, after one bus, two trains, three coffees, seven hours, and an infinite amount of patience directed at the three small infant boy people left to their own devices raised in a barn, no doubt. 2. Hot running water. Shower-time is such a luscious treat. 3. Men who are curious, broad-minded and aware, and whose knowledge acquisition breaks open their heart and elevates their spirit. It was 2009. Against your intellect every man since has paled. Thank you for conversations then, about which I still reflect today.